There seem to be two types of ways to watch live magic performances: Either you try to figure out the method and must know how it is done, or you simply enjoy it for what it’s worth and give in to the mystery of it all. I am in the unfortunate position of having to engage in the former. As President of the Academy of Magical Arts, I have to look at magic from a more fiduciary/directory perspective. I’m concerned with the nuts and bolts of the magic: what each effect consists of, what additional parts are required, what sound and lights are best, and how much will they all cost. Necessary? Indeed. Thrilling? Not so much. I yearn for those days when I could simply watch as a spectator and marvel. And so I ask of you tonight: Choose the latter. Sit back and enjoy yourself. Because I can almost guarantee you will find it impossible to figure out their methods. I say this not as a challenge, but as a fact. After having watched this very show 50, 60 times, I still just recently had to ask how certain parts were accomplished – they’re that good. You are in the hands of two masters at the top of their game. 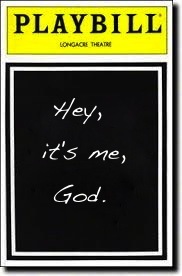 My kids claim I see God in everything, which I can’t deny, so why not in a Broadway Playbill? There is no limit to the where and how He communicates with me. This was a Godwink moment because my first thought was that Neil Patrick Harris could have been describing the life of a Christian. Albert Einstein’s quote says almost the same thing regarding faith: “There are only two ways to live your life. One is as though nothing is a miracle. The other is as though everything is a miracle.” My guess is he’d probably suggest choosing the latter as well. Harris’ comment also aptly describes students of the Bible. I’ve been studying scripture for many years with a wide variety of people – men and women of all ages - and I noticed exactly the same thing as Neal Patrick Harris. The people in my various groups usually fall into two categories: the ones who seek an explanation for everything and the ones who are comfortable with the mysteries of it all. The same can be said about life. We will never understand the how, where and why of God’s plan. We can only relax in the confidence that He is directing the show. There is a parenting guru whose name I can’t recall that suggests if your kids don’t like your answer, they’re going to like your reasons even less. His point being we don’t owe them an explanation, which will just prolong the argument. Well, the same logic holds true for God. He doesn’t owe us an explanation. He’s got nothing to hide, but even if we knew all the answers, we still wouldn’t understand or agree because His ways are not our ways. Plus, it would spoil the adventure the same way knowing the mechanics of the magic spoils the show. Personally, I choose to believe that I am in the hands of the Holy Trinity who are without a doubt masters at the top of their game yesterday, today and forever. I’m with Harris as he suggests to the audience: Choose to embrace the mystery—but I mean it in a divine sense as so many spiritual giants have done before me. Corrie ten Boom is a perfect example. Despite her desperate situation as a prisoner at Ravensbruck Concentration Camp where many must have felt forgotten or even forsaken by God, she claimed, “There is no pit so deep that God’s love is not deeper still.” Her unwavering belief that “faith sees the invisible, believes the unbelievable, and receives the impossible” was her saving grace. Lastly, Harris’ closing line is the best way to describe my daily quiet time with the Lord because it is in stillness and quiet when I have my best conversations – even if it is in a dark theatre. Maybe not every day but more often than not, as I quiet my mind and open my heart to His presence, I am blown away by His interest and participation in the smallest details of my life. I marvel at His miraculous ability to use the worst situations for good – turning ashes to stardust. I choose to start each day in stillness with this thought in mind, “prepare to be amazed.” I am never disappointed. By the way, the show was awesome!